Karl Kemnitzer and his solar-powered bicycles. 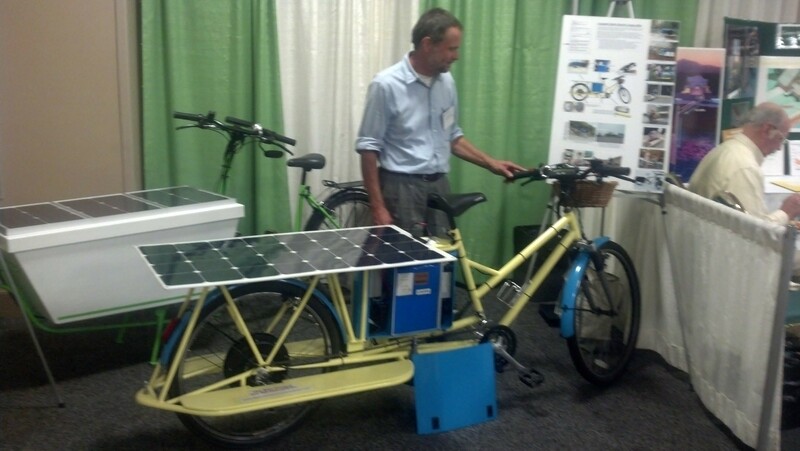 Past the solar-power displays, wedged between a Ford gas-electric hybrid car and an exhibit on geothermal power, Karl Kemnitzer was showing off his two solar-powered cargo bicycles on Thursday in the crowded exhibit hall at the Sheraton Burlington Hotel and Conference Center. He popped a solar panel off one and pointed to a box. "This big blue thing here, that's the battery," he told a one of a group of curious onlookers at Renewable Energy Vermont's conference and expo. Kemnitzer, of Hartland, said he built his bikes for practical reasons: The electric bikes supply some of the power for his 35-mile roundtrips into White River; pedaling does the rest. One of the bikes bore a sticker that read: "This bike climbed Mt. Washington." There are only a few dozen solar-powered bicycles in the world, Kemnitzer said. He doesn't sell them but would consider making a few more. "I'm here to let people know this is possible," he said. "I'm not the only one doing this." Sharing ideas related to renewable energy technology — from managing the power grid and heating homes to getting around on a cool-looking contraption — is what drew around 370 people to the start of the two-day conference that continues tomorrow. Sessions topics on community solar projects and financing options are among those scheduled. Presenters include David Hochschild of the California Energy Commission, Mary Powell, president and CEO of Green Mountain Power, and other representatives of government and industry. "I think the takeaway is when REV started in 2000, we were trying to convince people renewables worked," said Gabrielle Stebbins, executive director of REV. "We've arrived, and now we're problem-solving." In fact, some industry regulars couldn't attend the conference, she said, because they're "very busy building projects."